In 2008 I began collecting NASA images that inspired me. There are several that are begging to be painted, and I am obliging as best I can. To that end, I had some Pebeo paints and resins that I thought would be the perfect thing to use for this particular image of Mercury transiting the Sun taken by the Hinode telescope. Black acrylic on canvas board: one line, one circle. 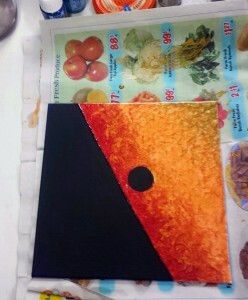 This is the first step of one I started in acrylic before deciding that it wouldn’t work for my plan. I ended up setting it aside last April while I searched for proper supplies. The still-drying Prisme effect paints. 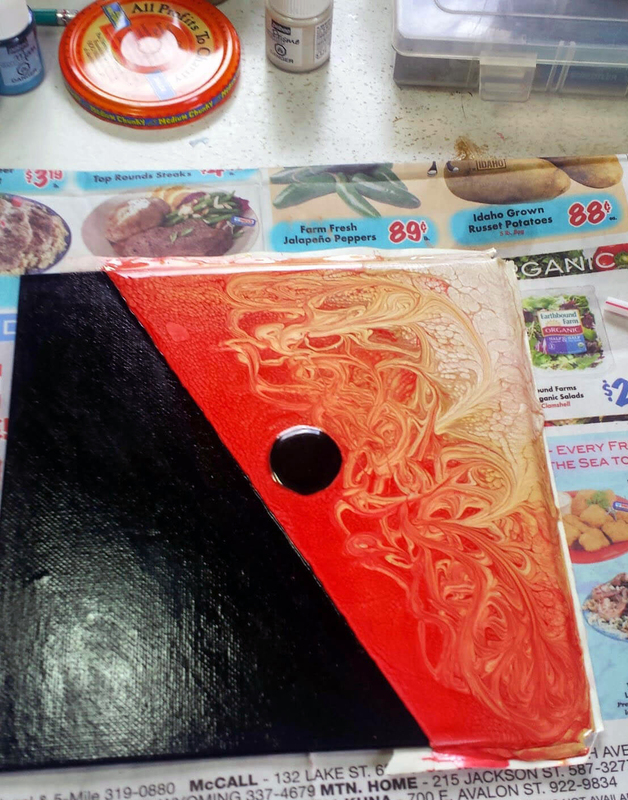 In May as Mercury entered Gemini I started over again with Vitrail black. This is a high gloss black with an enamel-like finish. This super shiny black sets off the Sun with Mercury silhouetted against it. 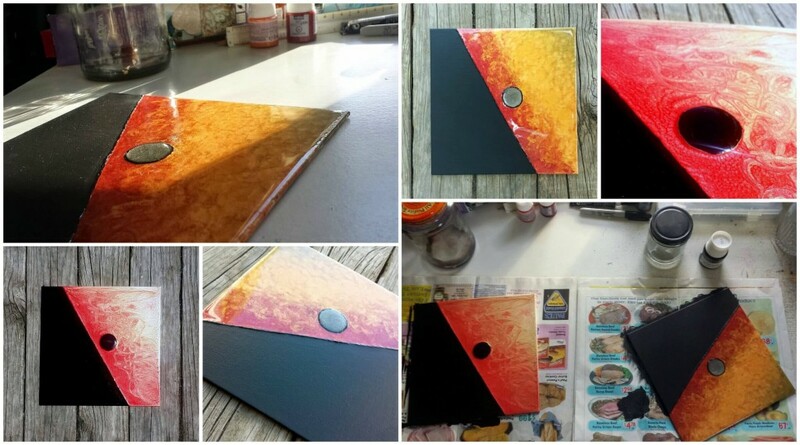 Over the black Mercury I poured the Glazing Resin for the magnifying effect.For the Sun I chose Fantasy Prisme colors in English Red, Antique Gold, and Eggshell White, poured liberally on the canvas and mixed as it dried. The dry Fantasy Moon effect paints. Working on this gave me the opportunity to rethink my approach concerning the acrylic painting I began with. I thought perhaps it could pair nicely with the Carmine, Apricot, and Gold from the Fantasy Moon Discovery Set and some black relief. A layer of Onyx later will give Mercury some necessary texture, but they sat for a couple of weeks at this stage. The dry Fantasy Moon painting. I came back to these shortly after Mercury began to retrograde to pour the final resins. 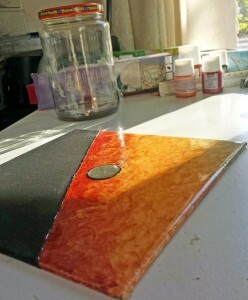 I poured the Crystal Resin in a single layer over the face of the Sun and allowed it to harden. 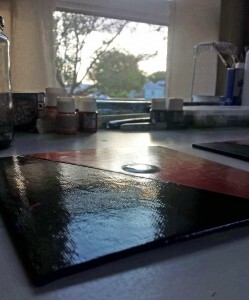 I followed with a final pour of Glazing Resin over Mercury to give it a dimension all its own. 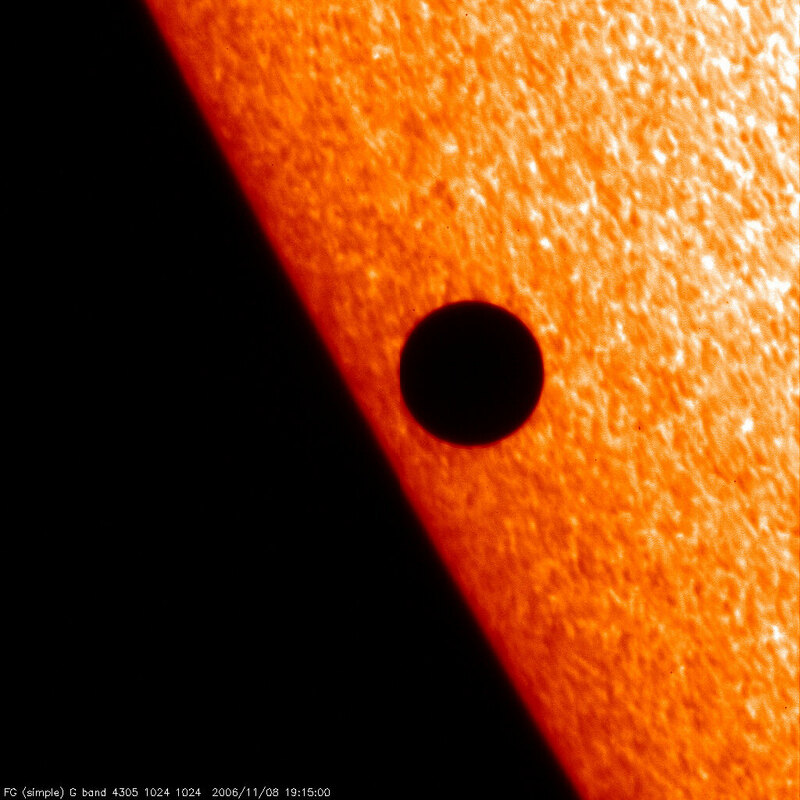 The result highlights the contrast between the matte black of space and the heat and texture of the Sun with Mercury against it, while its sister painting has the opposite effect. 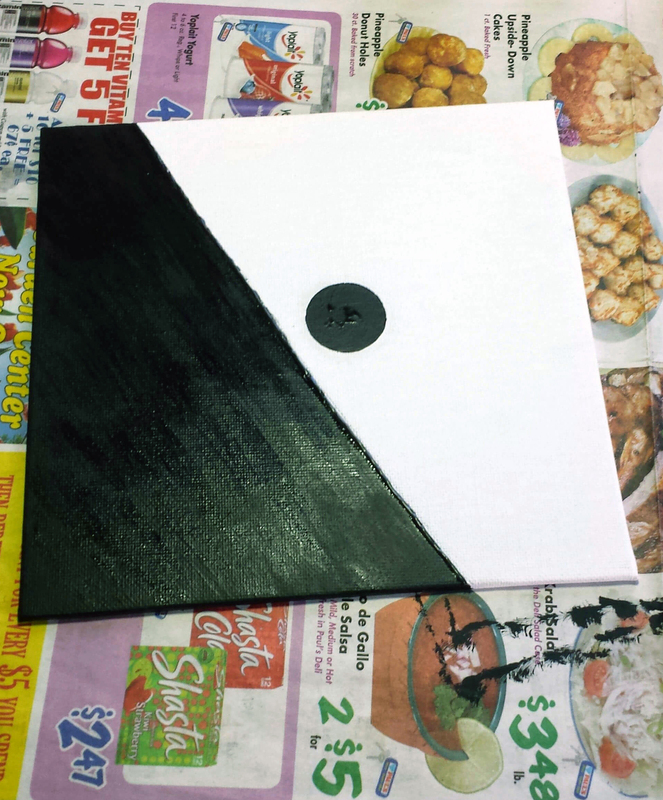 Both paintings received a second coat of black paint to achieve good, thick coverage. The black acrylic paint will be finished with matte acrylic varnish prior to sale. The finished paintings are available here and here.